Disney's Aladdin will be one of the studio's next animated classics to see a live action adaptation. Now, a new rumor has surfaced regarding who Guy Ritchie may be looking at to play the villain. While we're going to take this rumor with a significant grain of salt, it's being reported that Tom Hardy has been approached by director Guy Ritchie to play Jafar, the Royal Vizier to the Sultan of Agrabah, and while nothing has been decided, Hardy is apparently one of the director's top choices for the part. The rumor is being reported by The Sun in the UK and the sources are anonymous, thus we can't be sure there's much to lend credence to this rumor. Still, if it is true, it's an interesting choice and a fairly big get if Guy Ritchie actually does make it happen, assuming he's actually interested in making it happen. For whatever it's worth, the rumor seems to believe that the role belongs to Hardy if he wants it, scheduling is the only thing that might keep him from signing on. We're guessing it may the scheduling against his new Venom project which could be the issue. If Tom Hardy is considering taking on the role of Jafar, it wouldn't be the worst choice in the world. While we've never seen Hardy play a role quite like a Disney villain, that may be a good thing. Hardy can certainly play the bad guy, but the fact that he'd likely play the role very differently could mean that we could see a significantly different interpretation of Aladdin. This is probably good, as the closer to the animated version the live-action film tries to be, the more people will be thinking of Robin Williams and not the new movie. Rumors have indicated that Will Smith is potentially the one Disney is looking at to take over the role of the Genie. Like Hardy, it's not a bad choice, as Smith can certainly bring a lot of personality to the role, but it would be a very different personality than that of Robin Williams. In addition to the Tom Hardy news, The Sun is also reporting that the top candidate for the role of Princess Jasmine is currently, Jade Thirlwall, a member of the British girl group Little Mix. Indications had been that the film was looking for unknowns for the roles of Aladdin and Jasmine, and while Thirlwall, doesn't exactly qualify as unknown, she's only really known in the UK and this would be her first big screen acting role. Stay tuned to CinemaBlend as we'll let you know if there's anything to these rumors. Guy Ritchie's live action Aladdin is currently without an official release date, though Disney has carved out several potential options over the next few years. The latest word from behind the scenes of the forthcoming Aladdin live-action musical remake has Power Rangers star Naomie Scott being considered for the role of Jasmine. Thus far, English filmmaker Guy Ritchie has been firmly situated in the director’s chair for the new movie, which he and others have assured potential viewers will have an “authentic voice” that will not fall prey to whitewashing. So far, few of the main roles have been cast – with previous rumors swirling about Kevin Hart and Will Smith each being considered for the role of the Genie. Recently, the idea of Tom Hardy circling the role of Jafar has been bandied about, and as such any potential casting confirmations are definitely at the center of certain speculation on the behalf of fans of the original Disney animated musical classic from 1992 – and the latest word has the role of Jasmine honing in on a few particularly appealing options. According to THR, none other than Power Rangers star and the Pink Ranger herself Naomi Scott is being considered for the role of Jasmine in the forthcoming Aladdin live-action musical remake. Subsequent to sending out one of the largest casting calls this past March for the roles of Aladdin and Jasmine, Ritchie and the powers that be at Disney appear to be honing in on which relatively unknown lead actors they are hoping to cast as the iconic romantic duo. Scott is definitely an interesting choice for the role of Jasmine, though she will have to reportedly compete for the part against Indian actress Tara Sutaria. Set in the fictional Middle Eastern city of Agrabah, Ritchie’s Aladdin is currently one of the most sought after productions for up-and-coming actors in their 20s, and with filming slated to begin next month, Scott, Sutaria, and others will really have to step up their game if they hope to land the role of the film’s primary love interest. In the time since the release of the original Disney animated musical masterpiece some 25 years ago, the motion picture property has only served to grow in stature as an integral facet of a shared pop cultural imagination. On that note, here’s to hoping that Scott, or someone of equal talents, is confirmed for the lead role of Jasmine soon in Aladdin, and production can officially begin behind the scenes of the forthcoming live-action musical event. © Provided by The Hollywood Reporter Marwan Kenzari Marwan Kenzari, the actor who is poised to breakthrough as part of the all-star cast of the upcoming Murder on the Orient Express, is in negotiations to star as the villain in Disney's live-action remake of Aladdin. At the same time, former Saturday Night Live comedienne Nasim Pedrad has landed a role created specifically for the new movie. Will Smith is toplining as the wish-granting genie while Mena Massoud is the title character, a riffraff street rat who ends up over his head when he pretends to be a prince in order to win the hand of princess Jasmine, played by Naomi Scott. The story, which aims to remake Disney's 1992 animated classic while also taking cues from the folk tales in One Thousand and One Nights, is set in Agrabah, a fictional cosmopolitan city inspired by locations and cultures from the Middle East to India and China. Pedrad will land the role of Mara, the handmaiden and friend to Jasmine. The part is described as a comedic supporting role. Guy Ritchie is directing the project that has a script by John August (Big Fish, Corpse Bride). Dan Lin, who worked with Ritchie on Sherlock Holmes, is producing. Kenzari, who appeared in MGM's Ben-Hur and had a role in Universal's The Mummy, stars opposite Noomi Rapace and Glenn Close in Netflix's action thriller What Happened to Monday. In Fox's all-star remake of Orient Express, Kenzari plays the conductor of a train filled with duplicitous characters played by Michelle Pfeiffer, Daisy Ridley, Johnny Depp, and Josh Gad. He is repped by ICM Partners and Janey van Ierland at Nummer19 Films in Holland. Pedrad, who has also appeared on TV's Scream Queens and New Girl, is repped by CAA. I never realized it, but in the animation, Jasmine is really the only female character --- isn't that crazy?... So we wanted people to watch the movie and see Jasmine's relationship with another woman, and be like, 'Ah, that's what I'm like with my girlfriend,' or 'We would so do that if I was in that position.' That's something that's missing from the animation. It is absolutely crazy but it's true that Jasmine is the only female character of any note in Aladdin. There are women with lines in the "One Jump Ahead" song, but they are never given names and we never see them again. Early versions of the story gave Aladdin a mother, but she was eventually dropped. A modern version of Aladdin absolutely needs more women and by putting the other female character alongside Jasmine, we can see her in an environment the animated film never showed. As The Hollywood Reporter points out, this will have the new character essentially replace Jasmine's pet tiger Rajah, but as that relationship wasn't vital to the film, we're not really losing anything. The new character in question is Jasmine handmaiden Dalia, played by Saturday Night Live's Nasim Pedrad. While that puts Jasmine in a place of superiority, the relationship apparently won't be anything like that, as Naomi Scott says Dalia and Jasmine have been best friends for their entire lives. The Dalia character is so important to this movie because she's the only other female character. She may be the handmaiden but they're best friends; they're so close because they've grown up together. So it won't simply be two women together, but two women who know each other better than anybody else knows them. This should give us much more insight into Jasmine as a character than simply watching her have one-sided conversations with her pet. It's been unclear what the live-action Aladdin was planning to do with the animal characters that were part of the original film. Based on the fact that Nasim Pedrad's Dalia is essentially taking the place of Rajah, it now puts the casting of Numan Acar as Jafar's new henchman Hakim in a different light. There's a good chance Hakim is actually taking the place of Jafar's parrot Iago. That only leaves Aladdin's monkey Apu as an open question. There has been no casting announced for a human friend of Aladdin's, but there also hasn't been an announcement that Apu will appear. If the other animals are gone, Apu would look a little out of place on his own. Earlier today it was revealed that there would be a fan favorite missing from the live-action Aladdin, but it turns out that is not the case. According to a source close to the project, Princess Jasmine's pet tiger Rajah will indeed be in the film. There are certain staples of the animated Aladdin, and adorable sidekicks like Abu, Iyago, and Rajah are all definitely part of the magic. Rajah's main role is to serve as Jasmine's friend and protector within the confines of the palace, at least until she starts riding magic carpets with Aladdin. Rajah isn't exactly fond of Aladdin at first, but he does eventually come around. While the film will now include the beloved feline, it will also introduce several new characters, including the part played by Nasim Pedrad. Pedrad will play the part of Jasmine's handmaiden Dalia, and actress Naomi Scott will allow some opportunities to explore new parts of Jasmine's personality. While the film will add new pieces to the beloved film, it will also include plenty of respect for the original, including the music. Composer Alan Menken is returning for the live-action adaptation, coming off of Disney's massively successful Beauty and the Beast live-action project. 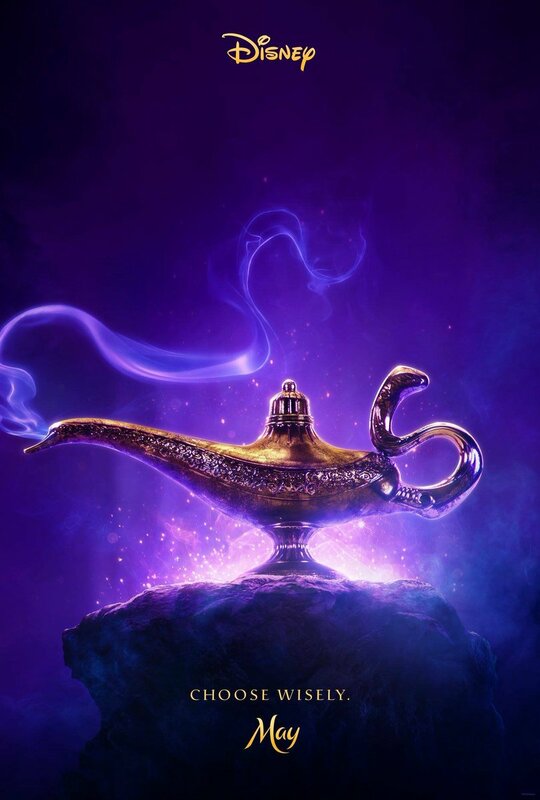 ALADDIN Poster Teases The Arrival Of Will Smith's Genie And Says To "Choose Wisely"
Disney has found a great deal of success with live-action remakes of its most beloved cartoons and 2019 will see the release of Dumbo, The Lion King, and Aladdin. The first teaser poster for the latter has been revealed today and while it doesn't tell us much about what we should expect from Guy Ritchie's take on the classic tale, we do get to see that iconic lamp and a hint of the Genie's upcoming arrival. He will, of course, be played by Will Smith and when the actor revealed this post on Instagram, he said: "LEMME OUT!! Can't wait for y'all to see me BLUE!" Does that mean an official reveal is coming? Almost certainly and it wouldn't be at all surprising if that lands before the year is over, especially as there are still quite a few big Disney movies on the way that the studio could attach the trailer to. Ritchie penned the screenplay for Aladdin alongside Vanessa Taylor and John August. Mena Massoud and Naomi Scott star alongside Will Smith as Aladdin and Jasmine, respectively. Are you excited? The first look images from Disney's live-action Aladdin remake feature Will Smith as The Genie, Mena Massoud as Aladdin, and Naomi Scott as Princess Jasmine. Directed by Guy Ritchie (Lock, Stock and Two Smoking Barrels, Sherlock Holmes), Aladdin is a re-imagining of Disney's hit animated 1992 musical and the Arabic folktale from One Thousand and One Nights that inspired it. The film is also the latest in a growing collection of live-action/CGI remakes of the Mouse House's classic animated filmography, joining titles like Cinderella, The Jungle Book, and Beauty and the Beast. Disney released a teaser trailer for the live-action Aladdin back in October, in the process teasing the iconic Cave of Wonders from the 1992 animated film. However, while the trailer showed Massoud's Aladdin approaching the famous magical lamp that resides within the massive cave, it didn't actually feature an appearance by Smith as The Genie (a role notably voiced by the late Robin Williams in the animated feature). Well, wonder no longer: the first photos of Smith in the film have arrived. 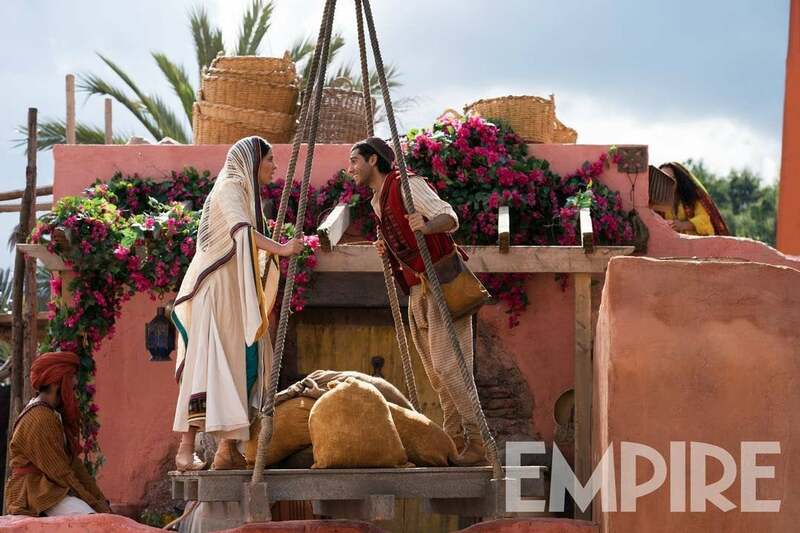 EW has published a handful of new images from the live-action Aladdin, along with a magazine cover that features Smith, Massoud, and Scott all together. Smith is seen here in his regular human form only, leaving it to a future trailer and/or photos to reveal his massive blue CGI design in the film. Naturally, Smith's appearance as The Genie will take some getting used to for those who grew up watching the animated Aladdin. Since Williams' Genie was totally blue in his giant and human-sized physical forms alike, Smith's iteration is already a noticeable departure in that respect. It makes sense, though; what works in 2D animation doesn't always translate smoothly into live-action, and having Smith walk around as a blue, yet otherwise regular human for much of the film might look cumbersome more than anything else. Similarly, it arguably makes sense for Smith to channel his classic screen persona as The Genie, much like Williams drew from his own comedic style in the animated Aladdin. That being said: here's hoping Smith's giant blue form in Aladdin goes over better than the physical design for a certain other blue character who's making the jump to live-action in 2019. We've finally got our first look at Disney's live-action Aladdin, including the lovable Aladdin sidekick Abu, and yes, he's adorable. 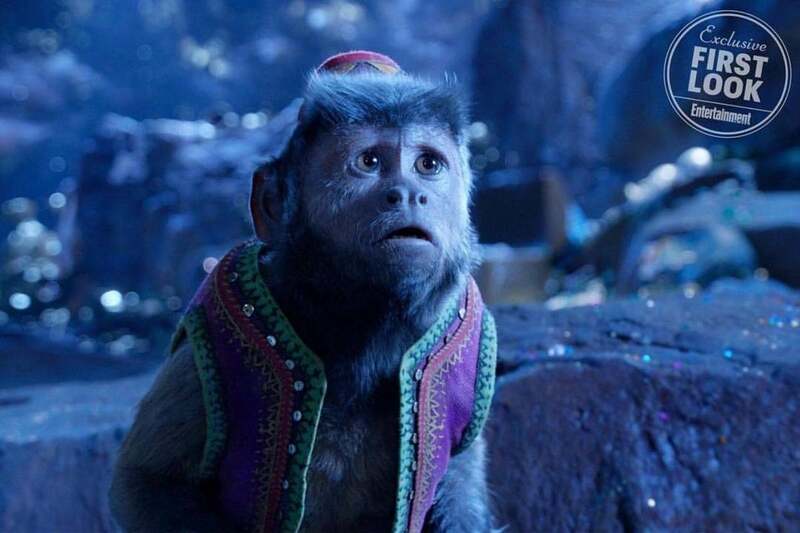 The new photos show off a few more of the characters fans have come to love from the original Aladdin, including Aladdin's monkey buddy Abu (via EW). The new photo shows that familiar vest and hat are making a return for the live-action version, and as far as we can tell Abu seems to be mostly made out of CGI. In the photo, Abu is looking up at someone with a very concerned look, and from the surroundings (especially all the glittery stones) they could very well be in the Cave of Wonders (that could be treasure in the background. They could also be on a very shiny mountain though, and if so we want to know how we get a shiny mountain because shiny mountains are awesome. (Photo: EW) You can check out the photo above. Guy Ritchie is helming the new Aladdin movie, from a script he co-wrote with Vanessa Taylor and John August. 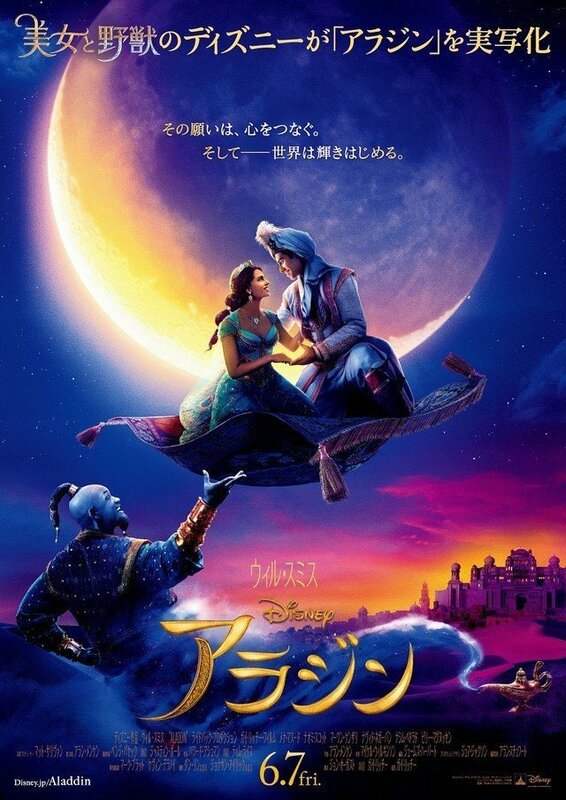 The film stars Mena Massoud (Aladdin), Naomi Scott (Jasmine), Will Smith (the Genie), Billy Magnussen (Prince Anders), Nasim Pedrad (Dalia), Marwan Kenzari (Jafar), Numan Acar (Hakim), and Navid Negahban (Sultan). Aladdin is the latest in a long line of live-action remakes for Disney, though it is a trend that shows no sign of stopping. Beauty and the Beast managed to bring in a plethora of box office receipts, resulting in a domestic haul of over $504 million. Worldwide it managed to pull in over $1.2 billion in ticket sales, and hopes are high that Aladdin, a long beloved film for Disney, will do something similar. In addition to the first look at Will Smith's live-action Genie, Disney's Aladdin has also unveiled the debut photo of its terrifying villain, Jafar. On Wednesday morning, Entertainment Weekly shared the first batch of photos from the live-action, Guy Ritchie-directed Aladdin, which includes several looks at the most popular characters from the original film. 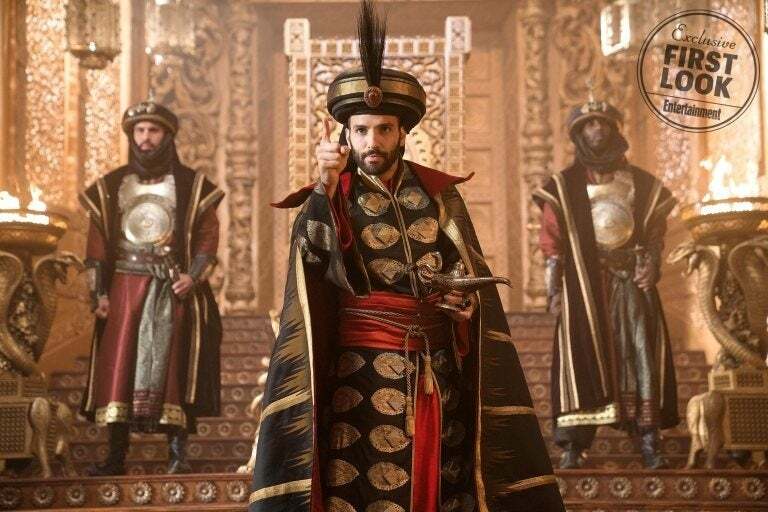 Chief among them is Jafar, the villain played by actor Marwan Kenzari. You can check out the first photo of Jafar below! (Photo: Daniel Smith/Disney) In the photo, Jafar is donning his classic red and black robes, but they are far from the most important part of the image. As you can see, the villain has Genie's lamp in his hand. This isn't really a spoiler for the movie, mind you. In the movie, Jafar is after the lamp for his own selfish purposes, just like the character in the original version. It's Jafar who sends Aladdin into the Cave of Wonders in the first place, keeping himself out of harms way while the young street rat risks his life for the lamp. We technically got a glimpse at Jafar in the first Aladdin teaser, standing outside of the Cave of Wonders, but he was so far away you could only recognize him from his hat and staff. Will Smith's Genie in 'Aladdin' Described as "Part Fresh Prince, Part Hitch"
Replacing the iconic Robin Williams is no easy task, so Will Smith isn't going for a beat-for-beat recreation of the Genie in Disney's upcoming live-action Aladdin. Rather than try to make a similar character, Smith and director Guy Ritchie are looking to build their new Genie from the ground up, infusing as much of the actor's infectious personality into the character as possible. It's that iconic Will Smith charm that has led one Disney executive to praise the look and feel of this new Genie, calling it "part Fresh Prince, part Hitch." The first look at Smith's Genie came on Wednesday morning, as Entertainment Weekly revealed plenty of details regarding the new Disney film. In the cover story, Ritchie explained that infusing Smith's personality into Genie was necessary in order to separate him from the dazzling performance Williams gave in the original 1992 classic. “The great thing about the role of the Genie is that it’s essentially a hyperbole for who that individual actor is, so it’s a wonderful platform and tapestry for an actor to fill his boots on,” Ritchie said. As for Smith, taking on the role was sort of daunting, but he did it the only way he knew how, which led to the inspiration from his previous roles. Ritchie went on to give a brief description of this new Genie, since one photo can only say so much. “I wanted a muscular 1970s dad,” the director revealed. “He was big enough to feel like a force — not so muscular that he looked like he was counting his calories, but formidable enough to look like you knew when he was in the room. The vanity of Smith's Genie is front and center in the character's first scene on-screen. When Aladdin arrives in the Cave of Wonders, and rubs the lamp for the first time, Genie appears from his captivity only to be surprised when Aladdin doesn't recognize him. The first teaser poster and trailer for Aladdin didn't reveal much when they were released recently, but the curtain has finally been pulled back on Guy Ritchie's live-action remake of the classic animated movie. That came courtesy of an Entertainment Weekly cover reveal earlier today and, well, pretty much everyone is talking about Will Smith's Genie! You'd think studios would learn not to show unfinished characters off this soon as there's always a backlash, but the actor has since cleared things up and you'll find details on that below (spoiler alert: he will be blue and a CGI creation). For now, though, we have a brand new gallery of official images and you need to check these out! As well as first looks at characters like Abu and Jafar, we see more of Aladdin and Jasmine. Say what you will about Ritchie, but things are looking good for this one so far and Disney has a pretty solid track record with these remakes, so here's hoping it's up there with The Jungle Book. To take a look at these images, all you need to do is click on the "View List" button down below. Abu looks incredible in live-action and that's going to make a lot of fans happy. In this shot, Aladdin's monkey companion appears to be in awe of something in the Cave of Wonders (Genie?). The Sultan's advisor Jafar (Marwen Kenzari) is the lead villain here and he obviously has his own nefarious reasons for wanting to get his hands on the magic lamp which the Genie calls home. Naomi Scott is clearly going to rock some impressive looking costumes throughout the course of this movie and it's said that Jasmine's arc will see her seeking power to protect her people. Aladdin and Jasmine go on the run from palace guards through a tannery and, believe it or not, this realistic looking set was actually created in London (where Guy Ritchie shoots most of his films). Back in 1992, Jasmine only had her pet tiger Rajah to talk to. Here, she'll be joined by new creation Dalia (Nasim Pedrad), her handmaiden and best friend. Expect her to deliver plenty of laughs. A hero in the making, Aladdin shields two children from impending danger in Agrabah but what they're facing off with is hard to say. That little boy doesn't look particularly bothered by it, though! Just like in the animated movie, an undercover Jasmine bumps into Aladdin as she wanders around the streets of Agrabah. Disney avoided doing a Prince of Persia when it cast these leads! Will Smith has taken to Instagram to confirm that this is just Genie's human disguise and he actually spends the majority of the movie as a CGI character who, yes, is indeed going to be blue. Aladdin director Guy Ritchie says the Disney live-action reimagining was careful to address concerns over replacing Robin Williams’ beloved blue-skinned Genie. “The great thing about the role of the Genie is that it’s essentially a hyperbole for who that individual is, for the actor, so it’s a wonderful platform and tapestry for an actor to fill his boots on, and Will Smith is an extrovert and you need an extrovert for Genie,” Ritchie told EW of the Suicide Squad star stepping into the role of the magical wish granter, who is freed from a centuries-long slumber by street rat Aladdin (Mena Massoud). Williams’ Genie frequently slipped into exaggerated anachronistic impressions — sending up more than a dozen celebrities, including Rodney Dangerfield, Robert De Niro, Jack Nicholson and Arnold Schwarzenegger — something Smith’s Genie avoids. “There’s a lot of mimicking that takes place in the original and that’s very successful, but we went on a different path with this one,” Ritchie said. Disney on Wednesday unleashed the first look at Smith’s human-looking Genie, who sports similar facial hair and ponytail to Williams’ animated and spectral-like figure. Smith has since confirmed his Genie will be blue and CGI for “most of the movie,” taking on his human-slash-disguise form likely in a sequence mirroring the “Prince Ali” showstopper from the 1992 animated classic. The new spin on Genie, described as “part Fresh Prince, part Hitch” — two of Smith’s smooth and confident characters — comes as what Smith describes as half homage, half fresh take. 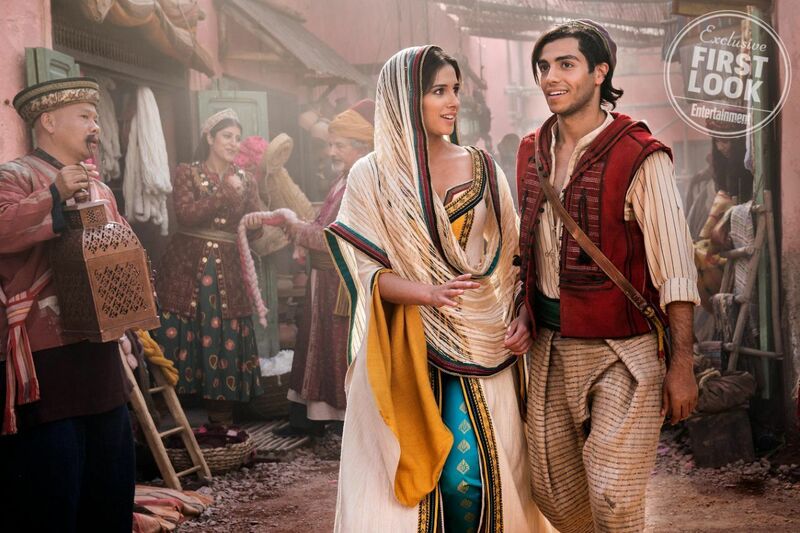 "They’re the perfect partnership because they both need each other and teach each other," Naomi Scott says about a Jasmine who will be "finding her voice" and wanting the best for the people of Agrabah. "She gradually finds the courage to speak out against injustice and that's kind of her objective from the start of the movie: ‘I see these people, I love them.’"
Not too long ago, Disney finally pulled back the curtain on Aladdin with an Entertainment Weekly cover story which showed off Will Smith's Genie in all his glory...well, sort of. The actor more closely resembled the Genie from the Broadway stage show than the cartoon version from the Disney animated movie and fans weren't happy. Smith was quick to clarify matters when he confirmed that it was just his human disguise and the blue Genie would, of course, be making an appearance (courtesy of special effects). 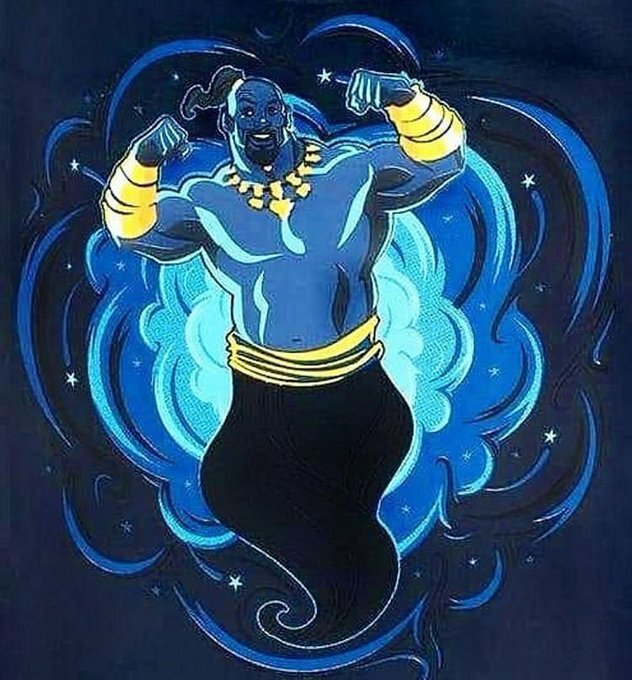 Now, some leaked promo art for Aladdin has found its way online and it finally shows off the live-action Genie in his classic form. Honestly, it's hard to fault this image because it's most likely what Disney fans want from Genie, and it will be interesting to find out what the CGI ends up looking like and if it does the beloved animated adventure justice. What do you guys think of this first look at Aladdin's Genie? Share your thoughts below. Disney's Aladdin is finally laying more of its cards on the table, and the latest one includes a new photo of Aladdin and Jasmine presumably meeting for the first time. The Guy Ritchie directed film will be Disney's latest live-action adaptation of a classic animated film, and in the new photo from Empire we see Jasmine (Naomi Scott) holding onto a lift across from Aladdin (Mena Massoud), and she doesn't appear to be very happy about the current situation. The same cannot be said for Aladdin, who is grinning from ear to ear. That also probably has to do with him possibly blowing her cover, as she is currently hiding her identity as she travels throughout the marketplace. You can get a sense of Ritchie's take on Agrabah from the background, and you can check out the full photo in the image below. 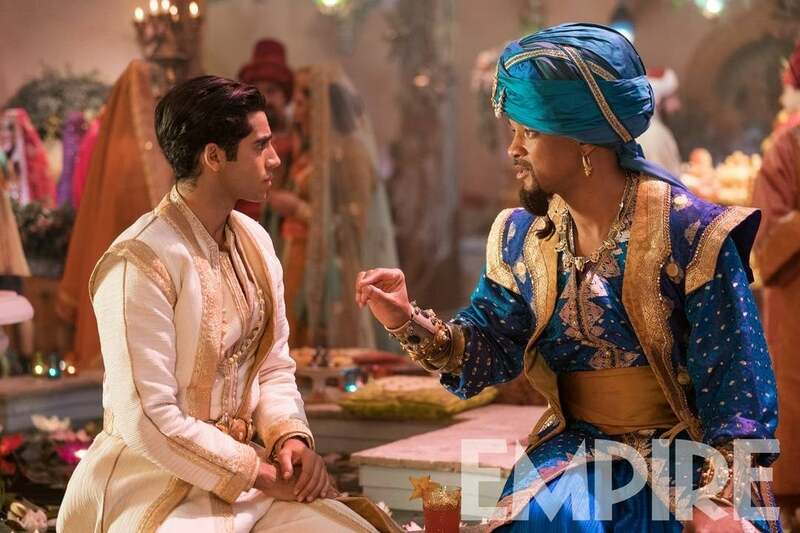 (Photo: Empire)Fans got to see much more of the anticipated adaptation thanks to a new Super Bowl trailer, which revealed more shots of Jasmine as well as Jafar, Aladdin, the Magic Carpet, and the big reveal of a blue Will Smith Genie. While all of those characters will play a factor in the film, some special attention was paid to Jasmine's overall story arc according to Aladdin producer Dan Lin. Jasmine has always been a fan favorite but adding that extra layer is more than welcome.